Comments can also be sent by email to 9-ASO-CLTEIS@faa.gov. The previous notice announcing a public comment period contained an incorrect email address. The FAA requests that all submissions to the previous incorrect email address be resubmitted to the new address. For more information on the planed project, see Airport Expansion Projects Include Fourth Parallel Runway and West Boulevard Relocation and the FAA web site at www.CLTEIS.com. 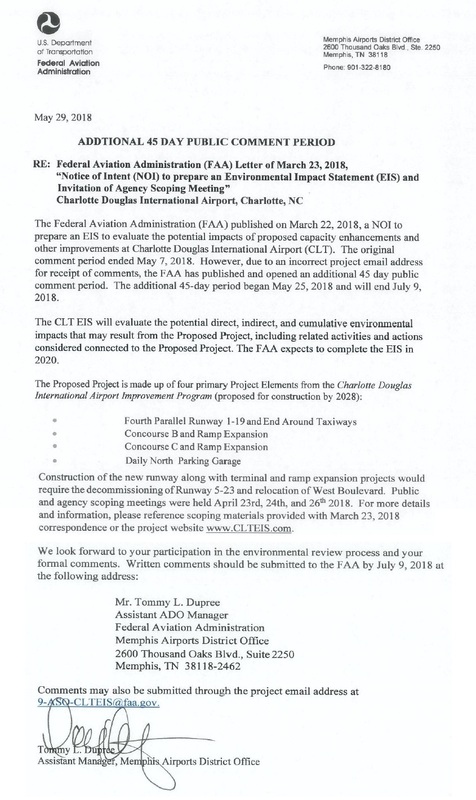 The Federal Aviation Administration (FAA) published on March 22, 2018, a Notice of Intent (NOI) to prepare an Environmental Impact Statement (EIS) to evaluate the potential impacts of proposed capacity enhancements and other improvements at Charlotte Douglas International Airport (CLT). The original comment period ended May 7, 2018. However, due to an incorrect project email address for receipt of comments, the FAA has published and opened an additional 45 day public comment period. The additional 45-day period began May 25, 2018 and will end July 9, 2018. The CLT EIS will evaluate the potential direct, indirect, and cumulative environmental impacts that may result from the Proposed Project, including related activities and actions considered connected to the Proposed Project. The FAA expects to complete the EIS in 2020. Construction of the new runway along with terminal and ramp expansion projects would require the decommissioning of Runway 5-23 and relocation of West Boulevard. Public and agency scoping meetings were held April 23rd, 24th, and 26th 2018. For more details and information, please reference scoping materials provided with March 23, 2018 correspondence or the project website www.CLTEIS.com. Comments may also be submitted through the project email address at 9-ASO-CLTEIS@faa.gov. To view a PDF version of the notice see ADDITIONAL 45 DAY PUBLIC COMMENT PERIOD. To view the Federal Register notice of the Additional Public Comment Period, see Federal Register May 25, 2018. The announcement regarding the Charlotte Airport begins in the middle of the first page.